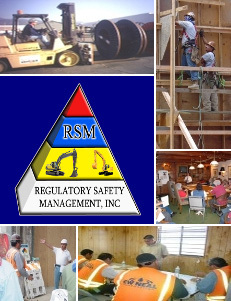 Regulatory Safety Management, Inc. has created a package that keeps you doing what you do best. We provide onsite training, evaluations, and required records. You provide the classroom and the equipment (we’ll do all the work). Schedule your Forklift Certification Class today! A combination of lecture, video, power point presentation, models and interactive discussion provides an interesting and informative session. A written test checks student comprehension. Completion certificates and wallet cards provided at the end of the class. Records can be maintained for recall. Pre-operational equipment inspection, operational instruction and a pass/fail operational test are combined to reinforce training. OSHA Requirements (understanding & regulation), Controls & Instrumentation, Engine Operation and Maintenance, Steering and Maneuvering, Visibility, Fork & Attachment Limitations, Rated Capacities, Stability, Inspection & Maintenance, Refueling, Load Manipulation, Pedestrians, Hazardous Locations & Rough Terrain Operation.